View from the Gatehouse: If we remove the ceiling... with a rope or two...! From the first glimpse of the Hall from between the farm buildings, to the moment the Mediaeval Courtyard opens up as visitors pass beneath the Tudor Gatehouse, Markenfield never fails to astound. Follow activities at the Hall in this Blog and find out more about "Yorkshire's best kept secret". If we remove the ceiling... with a rope or two...! We all know that Markenfield has its quirks - and its challenges - but who could have guessed that they might actually have built the house around a door! Known as The Dogs' Entrance (or Dog's Entrance depending on how many are in residence at the time) the wooden double doors leading out on to the moat are without doubt one of the Hall's gems. Over an inch thick, with ornate hinges and enough security built in to the back to stop a small army (don't even think about it okay...?) the doors have featured in many a wedding photograph. It is believed that the doors were hung there as part of the 1850s restoration, undertaken by JR Walbran on behalf of 3rd Lord Grantley. At this time numerous features were moved around - in part to protect some things from the elements*. It is not clear whether the doors were a part of the house's fabric before this - but that is where they ended up. Hung on metal "pintles" inserted in to the stone archway that surrounds it, over time the pintles rusted and finally last year a large section of stone facing was forced away from the wall exposing the hinges and meaning that the bottom stone of the doorway needed to be replaced. Then we discovered that we couldn't get the door off! 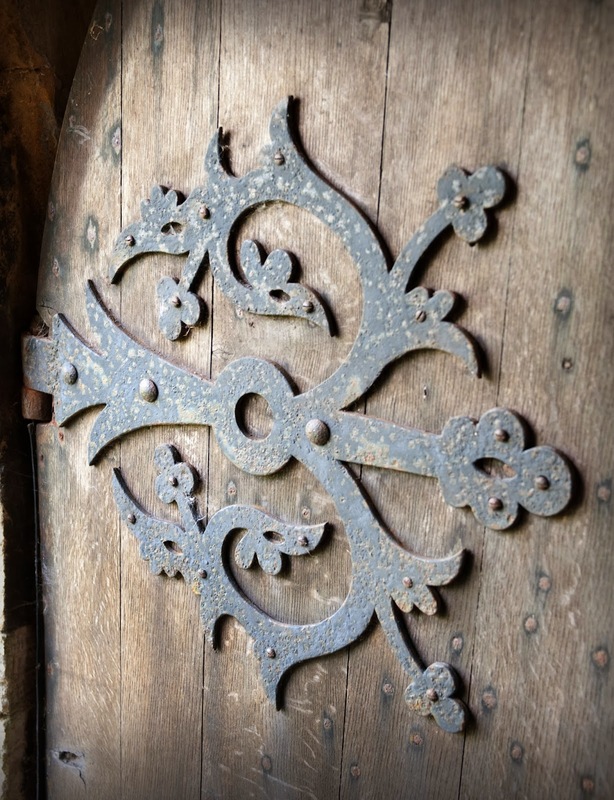 The pintles are essentially large hooks - the door needs to be lifted off them - but at every attempt to lift the door it hit the arched entrance above it. After a lot of head-scratching, several cups of tea and a fair amount of hysterical laughter... it was decided to leave them where they are. Just for a while. Answers on a postcard to...! Well, I know a family who have (really) built their house around an antique cupboard. So, why not build a house around a set of doors!